Grew Up… under the strict upbringing of her mother Charlotte Andergast. Charlotte was a famous pianist who had little time for her daughter. All Charlotte made certain was that Eva was properly regimented with piano lessons. Eva could never measure up to her mother’s expectations, no matter how hard she tried. Living… in a small village. Eva has been able to escape her mother’s city-dwelling, fast-living lifestyle, and has become accustomed to a simpler flow of things. She has married the village pastor, Viktor, and cares for her sickly sister, Helena. When her mother Charlotte comes to visit, for the first time in over seven years, old battles come back to the surface and tensions rise. What should have been a routine family reunion becomes something much more agonizing. Profession… writer. Eva has published two books, and she has had a small amount of professional success as a piano player – though nothing like that of her mother. Eva mostly spends her days taking care of her sister Helena, who is paralyzed. Interests… the past, Helena, the simple life, evading pain. Relationship Status… married. Her husband Viktor loves her, and she loves him. But it is a comfortable love more like friendship, and the two of them lack a deep connection or passion. Challenge… finding the courage to confront her mother. Charlotte’s visit doesn’t seem to be an attempt to seek forgiveness, though Eva feels entitled to that kind of treatment. Eva wishes that her mother would beg forgiveness for the years of psychological torture inflicted on Eva, who was made to feel un-beautiful and un-skilled. Personality… warm-hearted, meek, self-deprecating. Eva appears on the outside to be in the calmest state of her life, but she soon lets out the inner torment of a repressed, deeply bitter daughter. When her mother arrives, Eva says, “I’m just so glad to see you!” But there are other thoughts lurking under the surface, and they may not stay buried for much longer. Eva's popularity ranking on CharacTour is #4333 out of 5,000+ characters. See our top-ranked characters and read their profiles. 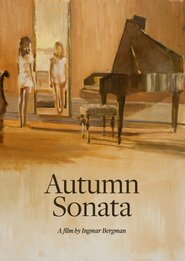 A young married woman invites her mother, a celebrated concert pianist, to stay with her. Tensions rise as their buried hatred for one another comes to the surface.